ST. GEORGE — While an additional $7 tagged onto the annual property tax of homes in the county was originally labeled as “pretty insignificant” by the general manager of the Washington County Water Conservancy District, those who spoke at a public hearing of the district’s board of trustees meeting Wednesday thoroughly denounced the proposed increase. 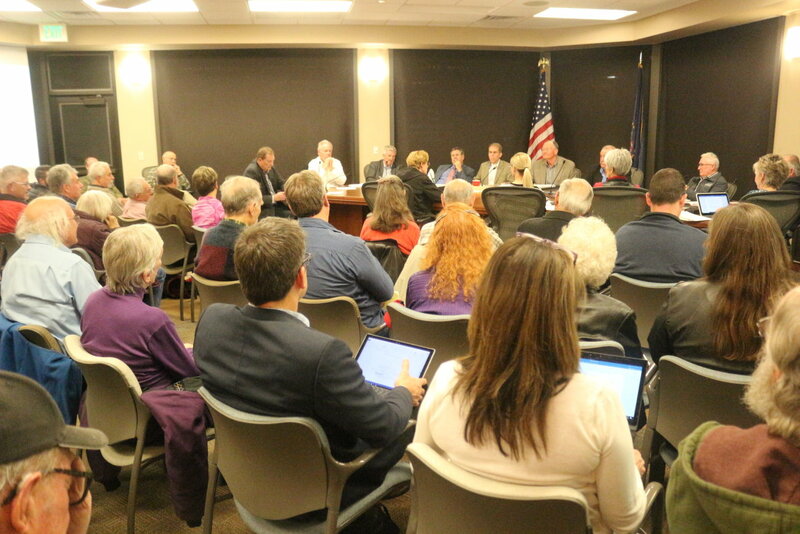 However, despite the protests, the board unanimously passed the hike following the hearing. The room was packed for the meeting, with some late-comers left standing along the wall. Many came to speak against the proposed tax increase due to the water district’s using part of the tax revenue to help keep rates low for customers. Opponents claim this practice promotes wasteful water use. They also condemned the tax hike due to revenues from it likely being applied to the Lake Powell Pipeline. Others said the people were taxed enough already. “It’s taxation by pinpricks,” said Tom Butine of the conservation group Conserve Southwest Utah, which opposes both the tax hike and the Lake Powell Pipeline. The property tax increase will raise property taxes on homes in Washington County an additional $6.81 on a home valued at $291,000. This translates to a bump in the annual property tax of $97.47 to the water district to $104.39 for a home at the listed value. The tax for a commercial property of the same value would increase an additional $12.39 a year to $189.61. While the tax increase is 0.000041 percent, it is estimated to help raise the amount of property tax the water district collects in 2019 by nearly 7 percent over the previous year. It is estimated the tax hike will produce $650,000 for the water district and will be applied to an overall estimated $1.6 billion price tag attached to the water district’s current and future capital projects. The Lake Powell Pipeline currently accounts for approximately $1.3 billion of the projected costs. Ron Thompson, the water district general manager, previously told St. George News that the increase was needed to help keep up with inflation. The water district applies property tax revenue to its capital projects, as well as public safety initiatives and several programs, such as flood control, watershed development, endangered species protection, water quality testing and drought protection. Property taxes account for 10 percent of the funding used for capital projects, with 15 percent coming from water rates and the majority, the remaining 75 percent, coming from impact fees collected from new growth. The water district has also proposed raising impact fees from around $8,000 currently to $15,000 or more in coming years as a way to help pay for the Lake Powell Pipeline. Water rates among municipalities that buy part of their water supply from the water district, such as Washington City and St George, have also increased by 10 cents each year since the district increased the wholesale price in 2016. The increase is anticipated to continue into 2019. However, the revenue generated from the 10 cent increase is applied to the cost of treating and delivering water. It is not used to fund current or future projects, according to water district officials. He said the water district subsidizes around two-thirds of the real cost of water for customers. This creates artificially cheap water that does not create an incentive to conserve. Conserve Southwest Utah and others have called for a tiered water rate system to replace property tax use. They say people will be more likely to conserve water as they are made to pay the actual price for what they use. Butine also said they hadn’t seen any plans for how the money from the tax hike would be spent. Not having a plan results in unwise and unaccountable spending, he added. “We should he talking about increasing water rates here,” a woman from Kanarraville, who hopes to move into Washington County in the future, said. St. Georgee resident Richard Spotts argued the property tax should be reduced or eliminated in relation to covering the cost of water, and he echoed Butine’s words about it promoting wasteful water use. Spotts also claimed the water district hoards up to 4,200 days worth of cash on hand, based on a study released by the Utah Rivers Council. This would allow the water district to operate for 12 years without the need for additional funding, he said. 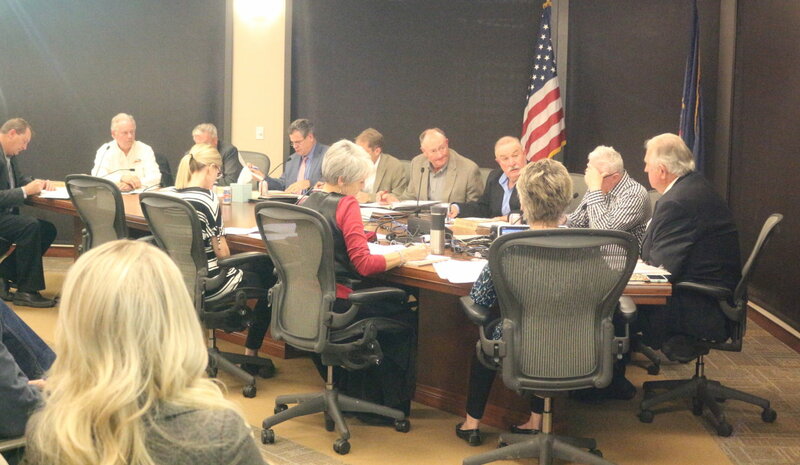 St. George News asked the water district about the claim prior to the board meeting. Karry Rathje, the water district’s public information manager, said the claim was untrue. Those who spoke Wednesday evening also railed against the Lake Powell Pipeline being needed in order to accommodate future growth. Some said they either didn’t want to see any additional growth or advocated for slower, more manageable growth that local water sources could actually support. According to population projections, Washington County is expected to reach 500,000 people by 2060. One man, who identified himself as a retired surgeon, compared the continuing growth – and efforts to encourage and accommodate it – to cancer. Calls for more water conservation and reclamation were also made throughout the public hearing. Lisa Rutherford, a longtime opponent of the Lake Powell Pipeline who is also associated with Conserve Southwest Utah, said the taxing practices of the water district are also hurting home affordability during an already tight housing market. Following the end of the public hearing, over half of the attendees left as the board called for a recess before voting. 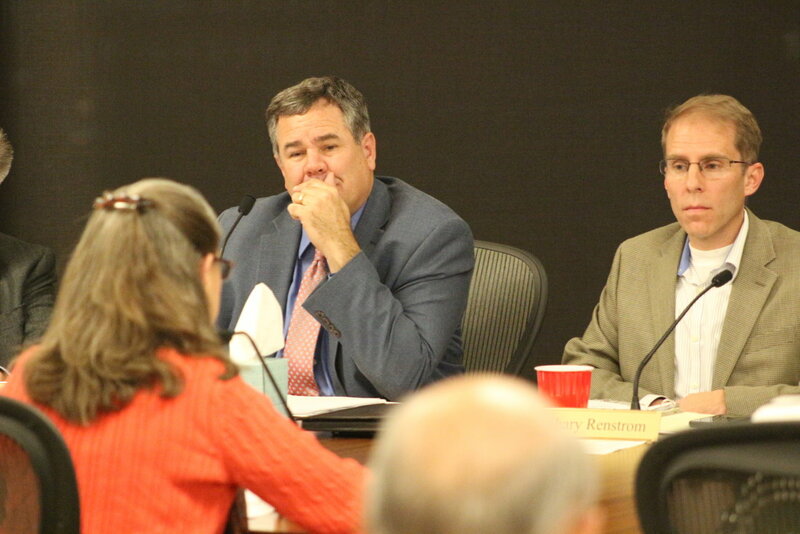 The board unanimously approved the tax hike, while also passing the water district’s $252 million budget for 2019 with the same vote. 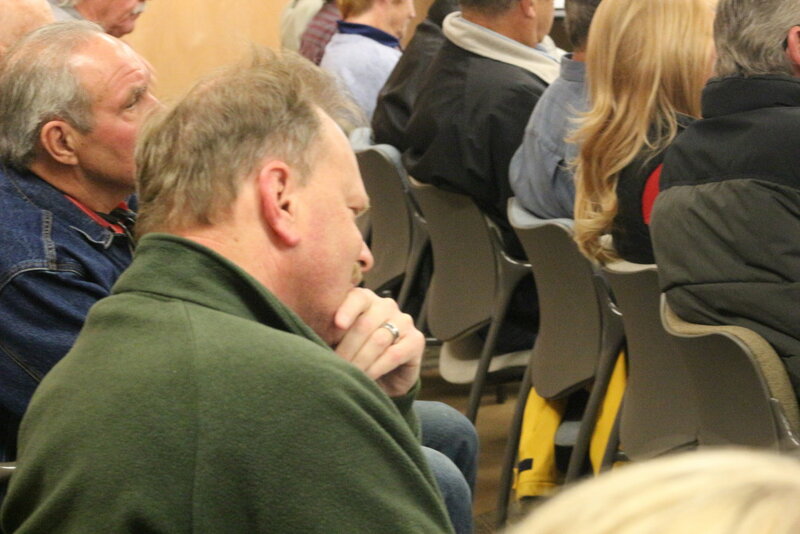 Following the vote, St. George Mayor Jon Pike said he was pleased to see so many people attend the meeting. However, he lamented the fact that many of their meetings, which can give the public a better understanding and education of what the water district does, are not often attended by the public. 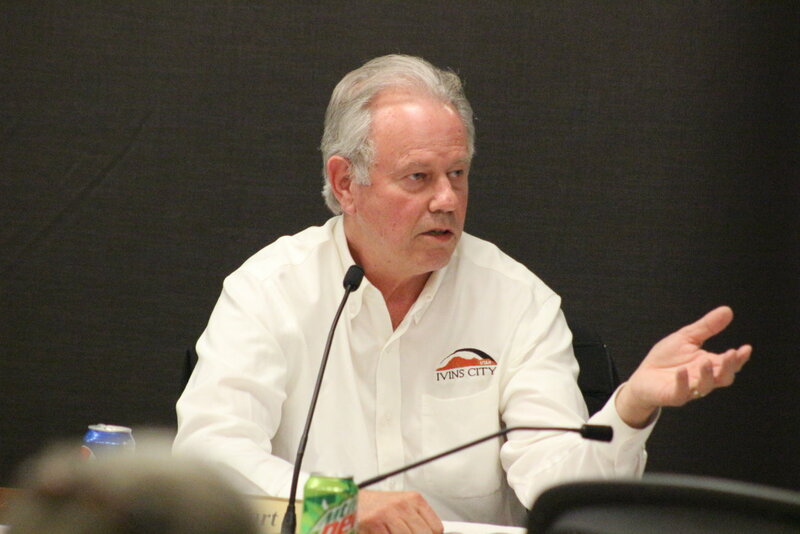 Ivins Mayor Chris Hart said he found it interesting that half of room left before the board could respond to the issue brought up during the public hearing. He said the mission of the water district and its board is to provide for the water needs of Washington County now and in the future, with the latter requiring long-term planning. “This body seriously goes about trying to decide the best way to go about achieving to that goal,” he said. Thompson also chimed in following the vote. Yes, Thompson, I prefer we regulate growth with water. Of course, Ivins Mayor Hart is a developer so he is all for over populating Ivins and the area. Every time you turn around there are these seemingly small taxes that just keep getting added to our tax bill. They think we do not notice…. want to expand anymore, turn the local golf courses into new housing developments? Only a very small percentage of our local population goes golfing, get rid of the golf courses. except Green Springs has bike trails. Close down the Green Springs golf course. The WCWCD is just the local, water version of the Federal Reserve. It is corrupt and self-serving. Kudos to the people who filled the room to voice their opposition. It wasn’t the dollar amount (this time), rather it was the method. Using propriety tax and not a fee based on amount used which would at least show the true cost of something we all need and not penalize those who conserve. Shame on the members of the water commission. After hearing from many in opposition to business as usual, the chair didn’t call a short recess, rather he stated that’s the end of public comment ! It’s easy to understand why so many left before the water board did what they were going to do no matter what. They moved forward (unanimously) but not before Mayor Hart in effect belittled the folks who spoke up, He and the rest of the board have studied the issue and know better how to spend your money. I’ll agree with Mayor Pike’s statement while this board isn’t elected the majority of members hold a public office. I hope enough people open their eyes to what local politicians are doing to ruin this area and vote for a new generation of smart growth that must step up. I’ve lived in Utah long enough to know that wont happen. We keep electing the same pro-development, pro-growth, pro-greed suits over and over again. The church pumps em out like Nike pumps out sneakers. More water equals more development. Evidence lay upon the topography of the whole Southwest and specifically our area…Washington County. It shows evidence to a previous culture/civilizations that inhabited this area and possibly lead to the truth of some myths/fables pertaining to a Meso-American culture. The pipeline…just goes to show you how far they are willing to go. There are other towns/cities that have a dire need for water…we are not one of those places. But to destroy and deface these topography depictions more and more water is needed not only in development but to sustain that development. Our area is truly unique and its being destroyed by greed! See through the lies and excuses! Its not wind from the UP that causes sickness…its the reflective nature of a certain element in the ground that leads to 2x exposure. Deceiving is the game…lies defined by words of “holy” are still lies! The sad thing..nothing will change and the notion of choice…is an illusion! Yep, what’s gonna happen will happen. These issues will be decided by the flow of money and the nature of greed and not by the people who live here. At least people are beginning to catch on to the modus operandi of the greedy *********s that run this place. If we can keep the cost burden of these personal greed projects away from property taxes that’ll be the one good thing. Utah LDS politics seem to be absolutely in love with regressive taxation. Big thanks to Mori for this informative article. I’m sure those who attended and others who read appreciate his work. Too bad that none of the board members was willing to break ranks and vote against the tax increase after hearing a room full of people say they don’t want more taxes and prefer water rates to reflect the true cost of water. When people are in the “in crowd” apparently they stop thinking and just move in lock step. Surely one could have voted the will of those in the audience and the tax increase would still have passed, but then he would have been “marked” and who wants that, right? Too bad we have such spineless leaders. However, since all the cities signed on to Thompson’s regional water plan back in 2006 they’re now beholden to him so perhaps can do nothing but be led by the nose. As for the leaders who admonished citizens for not staying to hear more, why would they? It’s just more of what we’ve been hearing for the past 10+ years about water and the Lake Powell Pipeline. Also, it was not clear to many that the tax matter would continue after the break, and the board made no effort to make that clearer. If the name of the government entity is the Washington County Water CONSERVANCY District . . . maybe they should focus on conserving water. Here is a great idea, buy 30,000 1.6 Gallon per flush (gpf), hire a plumber, and install those toilets for free in every home in Washington County that was built before 1992 (when the National Energy Policy Act of 1992 was passed that mandated water conserving toilets)! Now that would be saving water! Go to a Superbowl party at a home built before 1992 and see how many times in five hours that a five gallon toilet is flushed. What is the use of a pipeline if conservation is not being practiced? It is much like bailing water out of a rowboat that holes in the bottom of it. patch the holes as much as possible, or else your efforts at bailing are kind of useless. People need to get off their duffs and vote. As evidenced by the meeting results, the elected officials are going to manage as they see fit. I ran to be a true voice for the people, 27% agreed with me. Did they mention that 4 boards seats are up for replacement or renewal. I’ve applied to again try to speak for the people. Wish me luck. Is it true that Ron Thompson’s salary exceeds that of the STG Mayor and STGCC? If so, that is absolutely shameful. It is no wonder he built that big fat building up above STG. It’s his monument to excess. You’re going to pay those taxes rather you like it or not and thats just the way it is…..
Mayor Chris Hart “found it interesting that half the room left?! !” Apparently he wasn’t listening to the council members, just like he wasn’t listening to the tax payers during this meeting. The room was asked to clear out by the council. 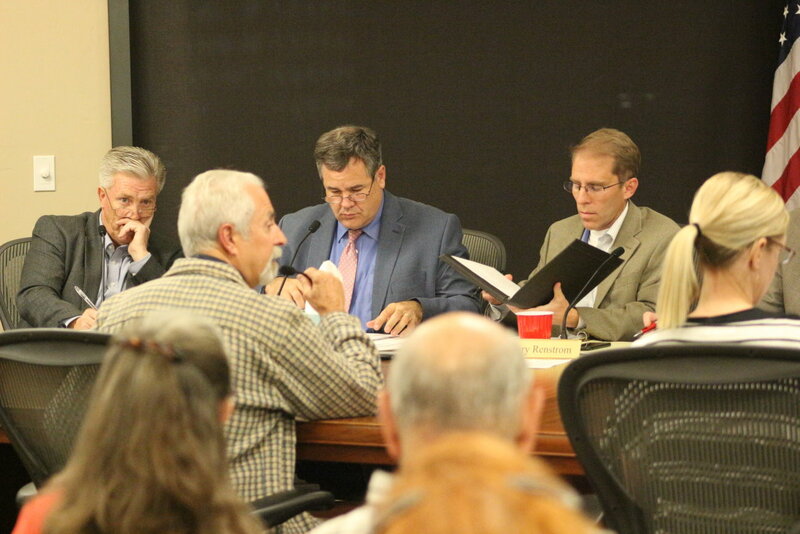 “Despite the protests, the board unanimously passed the hike following the hearing.” Ah, duh. Politics as usual ! Get out there and vote !! HA,HA,HA ! Cuz, I’m the taxman, yeah, Let me tell you how it will be. There’s one for you 19 for me. Cuz I’m the taxman, yeah, I’m the taxman. Beatles Revolver. The meeting was an exercise in catharsis. It was decided beforehand. Your expression of public defiance was simply a facade. So , how do we counteract this in the future? We have to be smarter because playing by the rules is just a waste of time.